Export groups from Google contacts, then import them into groups in your Mailchimp audience to target specific subscribers. In this article, you'll learn how to import groups from Google Contacts. To add groups from your Google contacts into groups in Mailchimp, you'll import each group from Google separately. 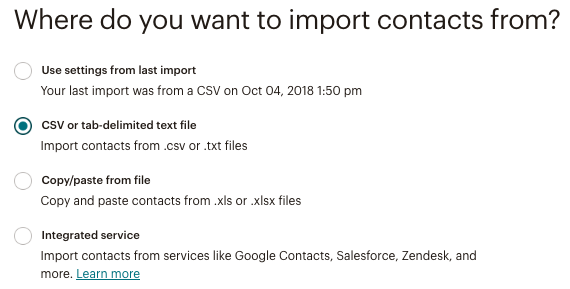 Follow Gmail's instructions to export a Google Contact group, and save the file in CSV format. Set up Mailchimp groups for each corresponding Google contact group you want to add to Mailchimp. To import a group into Mailchimp, follow theses steps. Google only allows you to export one group at a time, so you'll need to import each export file into Mailchimp individually. Click CSV or tab-delimited text file. 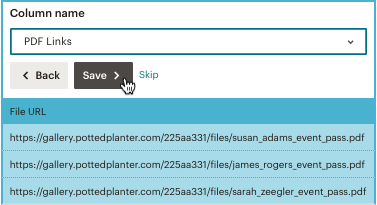 Click Browse and choose the file for your group from your computer. Click the I understand that my billing plan may be automatically upgraded checkbox. Your account will only be upgraded if your import causes your subscriber count to exceed your current billing plan. Click Next to move on to the Import Subscribers step and match the columns in your import to the columns in your Mailchimp audience. Click Save for the Email Address column. We automatically match the column in your import that contains email addresses to the required Email Address field in your audience. On the second column, click Save, or click the drop-down menu to select a different field. To create a new column in your audience, choose New Column Name. The editing pane for each column includes the current column name, field type, and example data from your audience, for reference. You can click Skip to move over a column and exclude it from the final import. This will not remove a column that already exists in your audience. Repeat Step 10 for all unmatched columns. You must match or skip all columns to complete your import. We'll display a success message when you've either matched or skipped all your columns. On the You're all set to import step, review the settings for your import, then scroll down to the Add imported subscribers to these groups section. 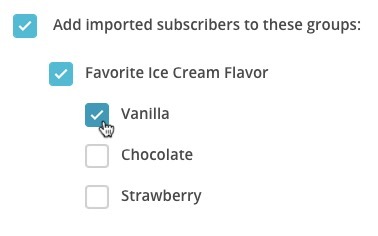 Use the checkboxes to select the group you want to import your subscribers to. After you finish your import, you'll be taken to the contact table. We'll display a status message to show you the progress of your import. Repeat these steps for each group you want to import to your Mailchimp audience. We'll email you when each import is complete.